JERUSALEM – Property taxes and land sales are at the centre of a growing dispute at one of the holiest Christian sites in Israel. 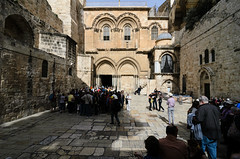 A dispute is escalating in Israel between Church of the Holy Sepulchre in Jerusalem and the national and municipal government, with taxation being at the centre of the disagreement. The current culmination of the disagreement was the temporary closure of the Church to visitors, which was done as a protest by the Church against its perceived mistreatment by the state. New regulations which are being enacted would remove the tax break currently enjoyed by the Church on all its properties. The Jerusalem municipal authority is claiming that church-owned businesses and property which are not used as houses of prayer should not be able to enjoy a break from local property taxes. Further, a proposal before the national government also seeks to limit the ability of the Church to sell off to private investors the lands that it holds. The dispute about the land arises due to the fact that the Church is one of the biggest landowners in the region, and has recently been embroiled in a scandal whereby it secretly sold off land which already had a significant amount of residential development and inhabitants.